CARLETON, Mich. (AP) -- Late in the spring, Bob Castaldi started checking used car prices online, wondering if it would be a good time to sell his family's loaded-out 2014 Honda Civic. What Castaldi found is evidence of a broader change in the car business: For the first time in three years, the price of used sedans has consistently risen, driven by demand from buyers who can't afford to join the seemingly never-ending U.S. SUV boom. "I was surprised to see that it had gone up," said Castaldi, who has had inquiries but no offers yet. "We had 11 straight weeks of price appreciation this spring and summer when we'd normally see depreciation in used vehicle prices," said Jonathan Smoke, chief economist for Kelley Blue Book. Used vehicles usually lose 1 percent of their value per month as they accumulate miles and due to normal wear and tear. Under normal circumstances they only appreciate in the spring when demand is high, at the height of tax refund season, Smoke said. Over roughly the past three months, used vehicle prices rose on average by 2.3 percent when they normally would have fallen by 2.8 percent, for a swing in value of over 5 percent, he said. All segments appreciated, but compact and midsize cars were the most pronounced, according to Smoke. The average price of a new vehicle in the U.S. has climbed steadily since the Great Recession to $35,990 today, up 3 percent over a year ago, according to Kelley Blue Book. That's out of reach of many buyers, analysts and dealers say. But the average four-year-old midsize car costs just $13,100, even though it's up 8 percent this year, according to Black Book, which tracks used sales and values. Compact car prices also are up 8 percent to $11,650. SUVs still cost more but prices haven't jumped as much. A four-year-old compact SUV now goes for $15,950, up 5 percent. "The demand is up on most everything and the supply is down," said Jeff Wichman, who buys vehicles for several dealers in the Lansing, Michigan, area. 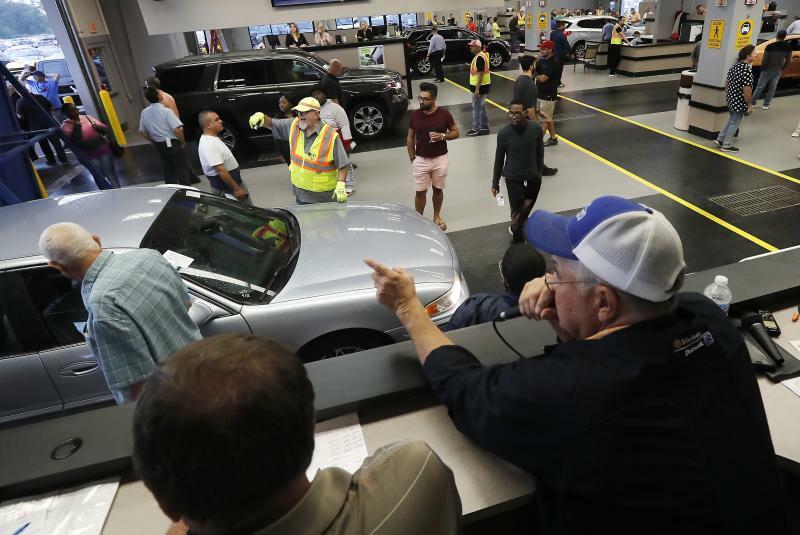 He was among hundreds of dealers and representatives looking for used vehicles at the big Manheim auction in Carleton, Michigan, near Detroit last week. He says cars are hard to come by, especially the Cadillacs he was trying to find for his clients. The unexpected demand is coming from "value-conscious consumers" who can't afford a new vehicle and may even be priced out of the used SUV market, said Anil Goyal, executive vice president of operations at Black Book. "It's more for transportation need rather than a custom need when you're looking for an SUV," Goyal said. The shift toward used cars is helping to push down new vehicle sales in the U.S. So far this year they're off about 1 percent from last year. They'll buy new compact Hyundai Elantras, which Hyundai is discounting, or they look at leasing or stretching out payments for as long as seven years, he said. "The bottom line is SUV prices continue to rise, new car prices are rising," making sedans a better value, he said. In 2015, cars accounted for just over 44 percent of U.S. new vehicle sales, but that shrank to 29 percent in August as the shift toward trucks and SUVs continues. Goyal believes the trend is unique to used cars and he doesn't see a resurgence in demand for new sedans anytime soon. And even the increase in used sedan prices may not last. Smoke says prices recently are starting to level off and even fall slightly, but they still aren't depreciating like they had been.